It's been a month since Chester Bennington's sudden and unexpected death sent shockwaves throughout the music community and left legions of fans mourning. 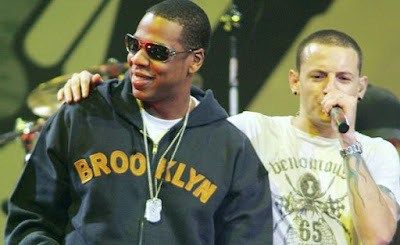 And when Jay-Z took to the stage at the V Festival on Saturday night, he took some time out to pay tribute to the late Linkin Park frontman as he ended his set with their 2004 chart-topping collaboration Numb/Encore. The 47-year-old hip-hop star said to the capacity audience gathered at Weston Park, Staffordshire: 'Can I get some love for Chester tonight?' before asking them to 'make some noise so he can hear you in heaven'. Chester, 41, died by suicide in July at his home in Palos Verdes, California.